Many hard working Americans were affected by the real estate and credit collapse of 2008. Housing values in most parts of the U.S. has now recovered. FHA Loans Are Most Popular Government Loan Program In U.S.
Home values throughout the United States have increased year after year. Higher debt to income ratios. When the real estate market crashed, it crashed super hard. The mortgage industry has completely changed and new rules and regulations have been implemented. Half of the mortgage loan originators have been eliminated after the Great Recession of 2008. The subprime market has become extinct because the government have place strict licensing guidelines. The Federal Housing Administration, also known as FHA, and the Veterans Administration, also known as VA, have created FHA and VA loan programs that made hard working Americans with prior bad credit eligible for mortgage loans. Mortgage lenders do not want to see any late payments after you have filed bankruptcy or have had a home foreclosure. The Gustan Cho Team at Loan Cabin Inc. are specialists in helping home buyers qualify for Bad Credit Mortgage Loan With No Overlays. 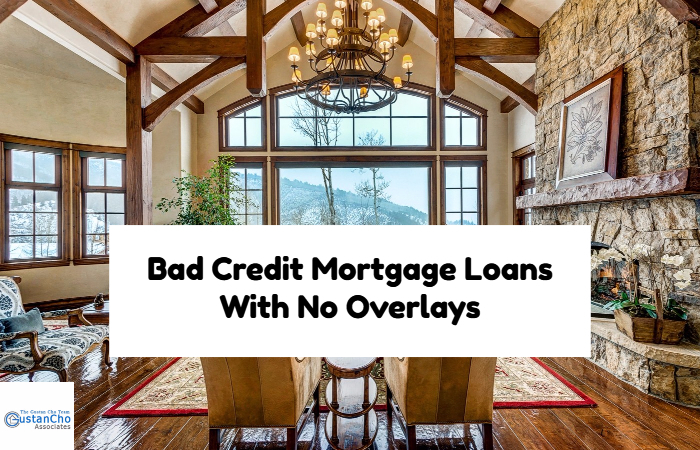 Home buyers who have any questions about Bad Credit Home Loan With No Overlays can contact us at 262-716-8151 or text us for faster response. Or email us at gcho@gustancho.com.